Megan is the Director of Administration for Nyman Turkish PC. She earned her Bachelor’s Degree in Political Science from the University of California San Diego with a minor in Communications. Megan was very active at UC San Diego, taking on leadership positions in several organizations. Before joining the Nyman Turkish team, Megan spent two years as an administrative assistant with USA Computer Link. Megan enjoys Social Security Disability because it gives her the opportunity to help those in need. Megan believes that most people who apply for Social Security are qualified, but they often lack the knowledge or experience necessary to pursue a claim on their own. 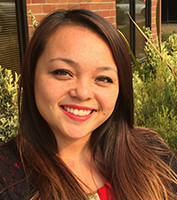 Megan relishes the opportunity to assist clients and get them the benefits they deserve. Most of all, Megan enjoys her co-workers and the friendly environment at Nyman Turkish. Outside of work, Megan enjoys reading, writing, and karaoke. She hopes to continue her education in the future by attending business school or law school.